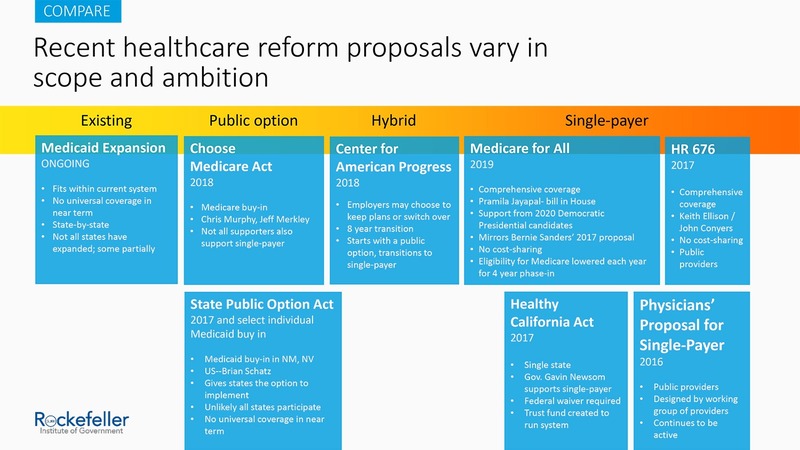 New coverage proposals, ranging from Medicaid or Medicare buy-in opportunities to a national single-payer plan, are front and center in health policy circles right now. At a recent gathering at the Rockefeller Institute, panelists engaged in a discussion of many aspects of these public plan options. The original motivation for the session was to focus on the complex design issues inherent in the various approaches to Medicaid buy-ins or public options that have been discussed in a number of states. Yet, more recently, the issue has been broadened considerably to include serious consideration of national proposals that involve expanding benefits and eligibility for Medicare to younger adults, creating a new public option to be sold in the individual market, or a single-payer system that would replace private insurance altogether. Earlier discussions of buy-ins were largely happening in states, and mostly focused on fairly targeted efforts to improve affordability in the individual market. The range of ideas currently in play shows the fluidity in health policy right now, with some proposals building incrementally — yet creatively — on the structure of the Affordable Care Act to expand coverage and improve affordability, while others are moving beyond our current system of public and private coverage options to create something altogether different. The relatively low uninsurance rate, combined with the broad support for Medicare for All proposals, suggests that affordability has overtaken coverage expansion as the prime motivation for reform. Coupled with other state and national efforts around prescription drug pricing and hospital charges, consumer dissatisfaction with the cost of healthcare is very much on the map for policymakers. It remains to be seen how, or whether, these issues get resolved, but there is every reason to expect healthcare to once again be a central issue in the next election. Slide from a presentation by authors John Kaelin and Katherine Hempstead at the “Medicaid for More?” forum at the Rockefeller Institute of Government on February 25, 2018. Existing beneficiaries have concerns about the potential impact of buy-ins. Lara Kassel raised an important threshold question about the scalability of public programs, pointing out concern that proposals to expand eligibility for either Medicaid or Medicare may dilute availability and/or quality of benefits for current beneficiaries. In Medicaid, this includes adults with intellectual disabilities and the medically frail. These concerns also explain why Medicare for All has not polled well with seniors. Provider availability will be a challenge to efforts to expand public plans. The Healthcare Association’s Courtney Burke raised the issue of provider capacity and availability, as well as willingness to accept public program reimbursement. 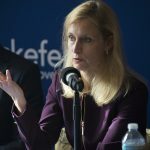 Both Burke and Lev Ginsburg, of the Business Council, expressed concerns that cost shifting to employer plans could result if more individuals are enrolled in Medicaid and Medicare. Some panelists also highlighted the need to look at cost trends in the existing delivery system and stressed the importance of transitioning to value-based payment models. Public sector administrative capacity is a critical input. Dan Meuse, who is working closely with many states on Medicaid buy-in proposals, noted that we should not underestimate the operational and administrative demands on state government to successfully implement large-scale expansions of public plans, and states should be clear about what problem they are trying to solve. Any healthcare system reform must consider broader factors. Burke also stressed the bigger-picture considerations with any reform proposals by pointing out broader workforce issues, retiring boomers, and the shortage of specialty care. Incremental change can be a pathway to sustained coverage expansion. Amir Bassiri from the Governor’s Office described New York’s success in incrementally expanding coverage to most New Yorkers as a good contrast to a one-step process to redesign the health insurance system. 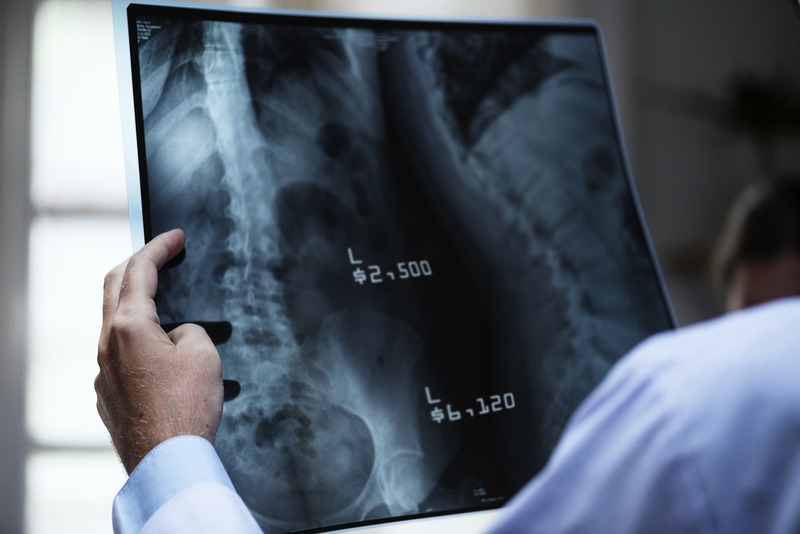 Through a combination of Medicaid expansion, a well-run state-based marketplace, and a basic health plan, along with a strong employer market, New York’s uninsurance rate has dropped below 5 percent. The interest in new policy approaches to coverage suggest that dissatisfaction with the status quo is endemic across the nation. Despite, or perhaps because of, the recent coverage expansion, unhappiness with healthcare costs is widespread, and it is identified as a key issue by a majority of voters in both major parties. Consumers are demanding accountability from their elected officials regarding healthcare costs. Activism at the state and local level around related issues, such as prescription drug prices and surprise bills, reflects this priority. Consumers are willing to consider any and all levers in their effort to reduce spending on healthcare, ranging from rate-setting and importing drugs to providing healthcare services through a public entity. While potentially an opportunity for bipartisan cooperation, it is also a potential liability for policymakers if solutions are not forthcoming. Katherine Hempstead is a senior policy adviser at the Robert Wood Johnson Foundation.